We hosted the Northern Canals Association meeting at Denstone Village Hall on 7th October, after which we took our visitors from canal societies across the north of the country to Crumpwood to see the progress made there since their previous visit in 2008. Last month we started to explore the spill weir in the Alton section, first identified earlier this summer. Our volunteers quickly uncovered the top of this structure which was buried just below the surface. It and appears to be largely still present, barring one corner which has fallen away, possibly as a result of tree root damage. Over the next few months this area will again be the focus of our attention as we would like to clear as much of the path as possible before next summer. As well as our own monthly work parties we will again be hosting our friends from Waterway Recovery Group, with WRG North West joining us for a weekend in December and our old friends from the Forestry Team returning for a week in February. I am hopeful that by late spring we will have completed the clearance of this section and can start to work out how to repair the two washed away sections which will need to be reinstated before we can open up this mile-long section of towpath to walkers. Reinstatement of the spill weir is key to this as the washed away sections are a direct result of the original spill weir becoming blocked up. 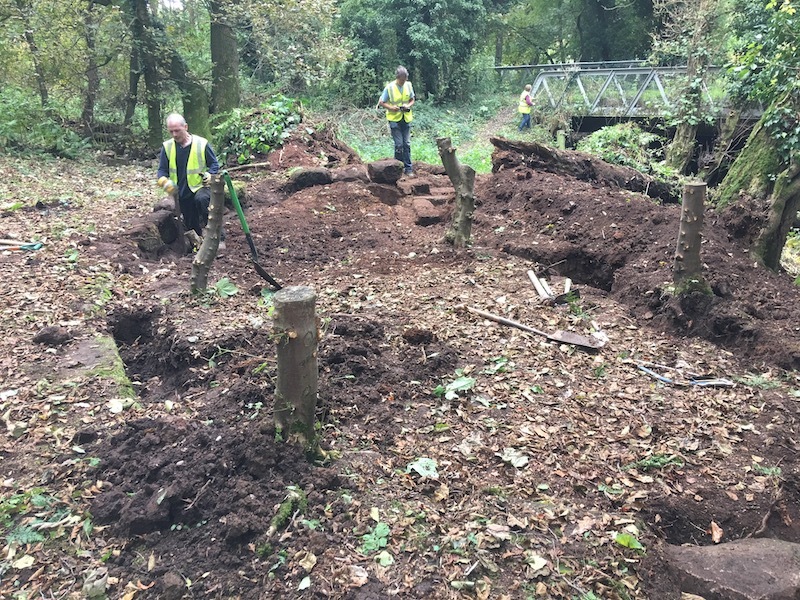 This month we will be returning to this site to continue work on the spill weir and also to resume our vegetation clearance along the towpath which was started in the spring, but had to be put on hold during the nesting season. Those travelling by public transport can meet either at 9:30 in the car park at Denstone Village Hall or 10:00 at Alton. We meet near to Alton Station, on Farley Lane. For those using satnav, put in ST10 4BY. There is parking off-road down a slope parallel to the former railway, opposite the station and we meet by the gate onto the line, which is now a public path. Please do not use the parking area on top of the bridge, as this is used by Landmark Trust guests. If anyone needs more detailed directions please get in touch. Thanks to everyone who has now signed up to this mailing list. Please do tell others about our project by linking to the CUCT website by email or on social media. The newsletter also appears as a news story on our website so you can share it to anyone who is interested.